Seventeen-year-old Holly Carroll hates the cold weather—sometimes she thinks she’s going to die of winter. She lives in New Hampshire, where snow’s a staple and everyone’s gearing up for the annual Ice Sculpture Festival. What Holly wants for Christmas this year is a boyfriend. In Bermuda. Then one day, she notices Jamie Winter. He’s nice, cool, and really good looking. He’s also sixteen—her younger brother’s age. Her friends want to know how Holly can even think about dating a junior. All Holly knows is that she and Jamie have a great time together. He’s not only fun, he’s sensitive. And whip smart. But that doesn’t stop her friends from trying to set her up. Suddenly, dateless Holly has prospects, like the twenty-one-year-old college man who drives a silver Corvette. And there’s handsome, popular Pete Stein, who suddenly seems interested. But no one can compare to Jamie. 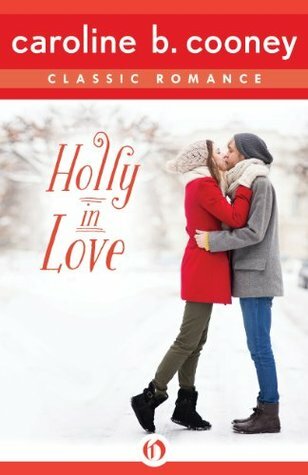 Is Holly willing to risk the scorn of her classmates—and her whole school—to be with the boy she loves? This was truly geared for teens and not for adults. This was a lot of teen interaction in her head. Not always a good thing but at times very amusing. I believe this author was trying to present a wholesome story and she did, yet to me there was a lot of endless babbling. (Yet, when you listen you my daughter and her friends this is what I hear. So on the mark.) That this story could have done without like how many times can you say you don’t like winter? What was funny, about the time I was really starting to get tired of it her friends were too? Holly endlessly talks, talks, and talks about how she hates winter and wants to be, live and or go to college any place tropical (Florida, LOL) to be warm. Which is a little hard to do in New Hampshire. There is a great deal to do surroundings with their majority of cold weather. All of which she hates. Holly is a 17 year old senior who rides the bus daily and on the breezy days hides behind the body of 16 year old Junior, Jamie Winter. Since most of the ones at the bus stop love winter especially snow they are practicing for snow sculpturing. Since she and Jamie dislike the cold and snow they start chatting each other up. Every one of her girlfriends makes a big deal about it saying she is robbing the cradle and things like that. Just by talking to him. At first she fights it, then one day she notices him for who he is a tall, strong, handsome guy.